What a trendy + delicious + healthy little bliss bowls situation we’ve got going on, and just in time for these icy-cold winter days where you need that plant power more than ever but all you want to eat ever is turkey with gravy and mashed potatoes and every morsel of stuffing ever made. Topped with more gravy. Or no – just me? This bliss bowl combo is the answer to the question WHAT DO I EAT IN WINTER TO STAY HEALTHY while NOT eating a cold and crunchy leafy salad. I do love a good cold and crunchy leafy salad, and I know you do, too. But friends. Have you been to Minnesota lately? It is a tundra. Maybe even The Tundra. Also 😃 beautiful, clean, generally quiet, full of Disney animals, and an almost perfect place to live (repeats mantra to self x 100). But there is a dark side to those truths, and the dark side is that I’m sitting in our studio right now sending all my positive energies to the little old heater in hopes that I will only have to wear my jacket in here for half the day. Plzzz. Warm bliss bowl > cold salad. And anyway, eaters gotta eat. Just look at that heaping-bowl-o-yum: bliss bowls were made for the real eaters of the world. *true story* – I guess I should have done this sooner, but literally right at this moment I just jumped over to Google to look up what bliss bowls are, technically, you know, like formally and officially. 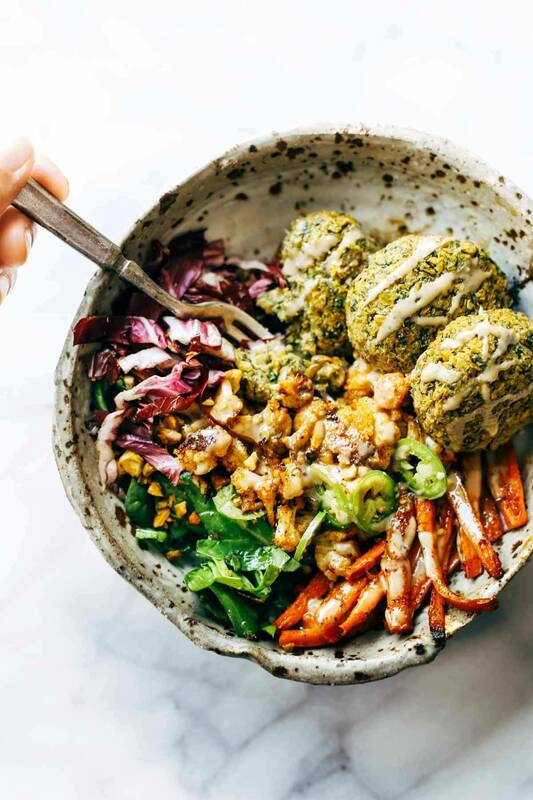 The only reason I called this a bliss bowl in the first place is because I follow a bunch of super-creative fitspo-food people on Instagram and they always post pictures of these beautiful things they call bliss bowls. But now that I’m looking it up, I’m realizing that maybe this isn’t as widespread a food phenomenon as I thought? And possibly it’s named after an item at a restaurant that I’ve never even been to? Too late now. I’ve been calling it a bliss bowl for the last 800 meals and it’s just too pretty to go back now, so bring on the bliss bowl rainbow. This ultimate bliss bowl “recipe” is not really much of a recipe. It’s more of a formula: falafel, greens, roasted veggies, spicy peppers and nuts and tahini / olive oil / lemon juice / honey for topping. <- I mean, that’s seriously it. That’s everything. You should probably use an exact recipe for the falafel, because that’s a little trickier to get just right. 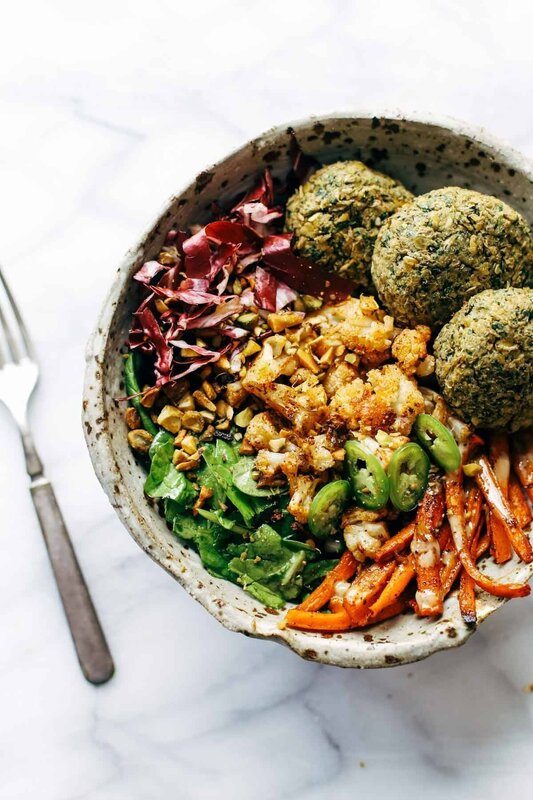 But the whole idea behind bliss bowls as I define them is to just pack in a bunch of pretty and flavorful and multi-textured and colorful plant-based foods into a dish and eat it all together in its combined wonderfulness. This recipe-formula is so flexible, so adaptable to whatever veggies you like or have on hand, and so AMAZING for make-ahead lunches. Not to spoil any future blog post surprises or anything, but I’ve also been just taking everything in the bliss bowls and stuffing them into naan or pita bread (but mostly naan, because warm, pillowy garlic naan is for sure the meaning of life) and obsessing over some of the most epic lunch sandwiches that have ever come out of my kitchen. It would NOT be a bad idea to double the roasted veggies here. Prep everything up, get it stored in separate containers in the fridge, and at lunchtime just toss it all together. Keep your glow all winter! Easy homemade falafel, roasted veggies, and flavorful sauce all in one big bliss bowl! vegetarian / vegan / gluten free recipe. 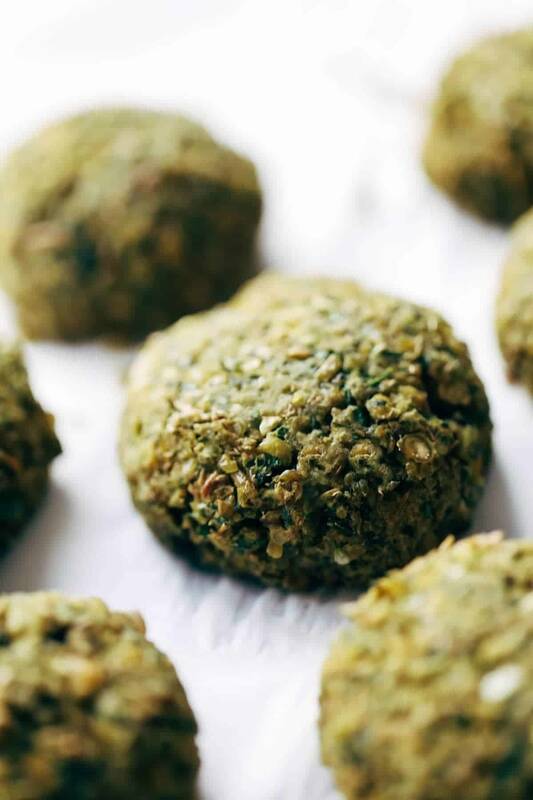 Falafel: Make this falafel so you have it all ready to go! It takes about 30 minutes. Nutrition information is for THE BASE of the bowl (the fresh veggies, the roasted veggies, and the nuts), without falafel, and without dressing. The falafel post includes its own nutrition label so you can tally up the total as needed. Generally speaking, the amounts will vary greatly with this recipe because a lot depends on how much and what you use for toppings. Winter bliss indeed!! What a beauty! That’s so fun to hear Dayna! Sign me up for team BB! Looks SO delicious and nutritious 🙂 Love that roasted cauliflower! I just can’t get enough! Thanks for the kind words Jill! These bowls sound AMAZING! 🙂 Loving this healthy winter meal! yes! so down for healthy (but stll cozy!) fare. and now that you mention pita, i can’t help but imagine all this in a pita with tzaziki. Our favorite bowl yet! The 2 hungry teens loved it (including the very big meat eater), my husband loved it, I loved it. The lentil falafel really completed the meal. And we agreed the falafel tasted better than my favorite veggie burgers I make and keep ready in the freezer. I cooked the lentils a little longer to give it had a smoother texture. We have made many of your recipes and loved them all! Tru dat! No boredom here. Thanks Nicole! Thank you Tonya! 🙂 B to the 4th! I love WARM bowls and the fact that “bliss” is involved…I mean it doesn’t get any better. I also say it is totally professional to wear slipper booties in your totally professional studio. Yes. For sure. That’s my definition of professional. I’m trying this tomorrow..everyone here loves falafel and veggies. Oh, and knee high woolen socks and a big fuzzy sweater should help, I hope. I love salads, but whoever thought it was a good idea to eat cold salads year round was NOT from Minnesota. Or anywhere else where it snows six months a year. This looks like exactly what I want to eat for lunches during the winter. Totally not wanting to have salads right now! This is a great healthy alternative! This is exactly what is needed during winter! The struggle is real with wanting to eat cold salads in the winter, yet the need for all the veggies that salads provide. I love this bliss bowl idea, and the name is adorable! Hope you warm up soon, I feel ya! Thanks Emily! 🙂 Appreciate that! Amazing 🙂 Just what I need before and after Thanksgiving, to offset all the heavy food that’s on the way. Still have yet to make my own falafel, but I feel like you’re making it mandatory here… I mean, how could I not?? Mandatory! Get on that, Michelle! Oh I love making bliss bowls! This is perfect because during the winter months I am a roasting vegetable addict! And I just started getting into tahini so I’m pumped to make some delicious dressings. Gotta try that falafel though! You’re so right… we need more plants in our lives. These bowls are a great idea. Might not be as good as the burgers I am constantly craving these days, but they are much healthier and I am sure they taste fantastic! The struggle is all too real. 🙂 Thanks Natasha! Could you even go wrong with falafel in a recipe?? Nooo, definitely. But you took falafel to the next level in a BOWL. What’s better than throwing all sorts of health into a bowl and stuffing your face with it? Nada. Oh good gravy! Thank you for the timely post!! Our first snow this weekend put me in full-on comfort food mode….fried pork tenderloins, mashed potatoes, chicken pot pie. Need BBs stat! Interesting! I have never heard of ‘bliss bowls’. I’ve always referred to something like this as a ‘buddha bowl’ (well, just in my head, not out loud). And apparently they’re also called ‘glory bowls’ too – th0ugh between you, me and the internet, that last one sounds kinda dirty. On a related note, where did you get the ceramic/stone bowl in the photo? I’ve been seeing that bowl in a few of your other posts and think it’s so pretty. I love this, I do a similar thing with different grains and I always called them just grain bowl (can I be even more boring). Anyway, this sounds delicious. Never made a baked falafel though, sounds great! Hope you like it, Kristina! Northern Minnesotan here – you are so right! I really struggle with eating healthy in the winter because I want warm food. And you can only have so many variations of soup, right? This looks delicious! Could I swap the spinach with kale or arugula? I’m allergic to spinach. Oh. Yum. I want this in my life already!!! Falafel is one of my current food favs, so you are killing me right now! Plus, anything with pita, naan or anything soft and sandwich-y automatically owns my food heart. So you have me super-excited for that upcoming post. We call these wonder bowls in my house! This looks sooo good! I really struggle to eat healthily during the winter when all I want to eat is warm carbs… but if anything can tempt me to crave healthy food it would be this! Hope you like it, Hannah!